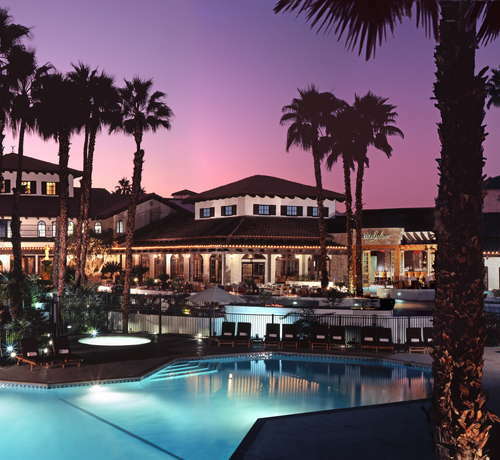 With a central valley location that makes it easy to access attractions throughout the Coachella Valley, the 240-acre Omni Rancho Las Palmas Resort & Spa is well situated (and well-appointed). Families will appreciate all the kid-friendly amenities, like three pools, a lazy river, and water slides, plus the Omni Kids Crew activity pack. There’s also a pop-up dinner series with themed events and seasonal offerings. 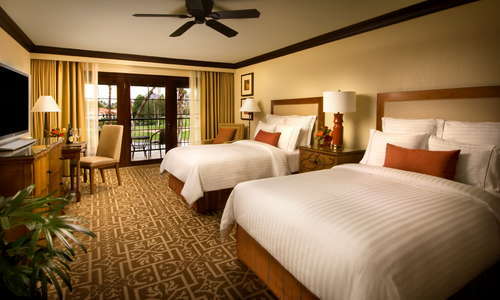 Rooms have an upscale hacienda feel. For couples seeking to connect, the spaces, with their bold fireplaces, evoke southwest romance. 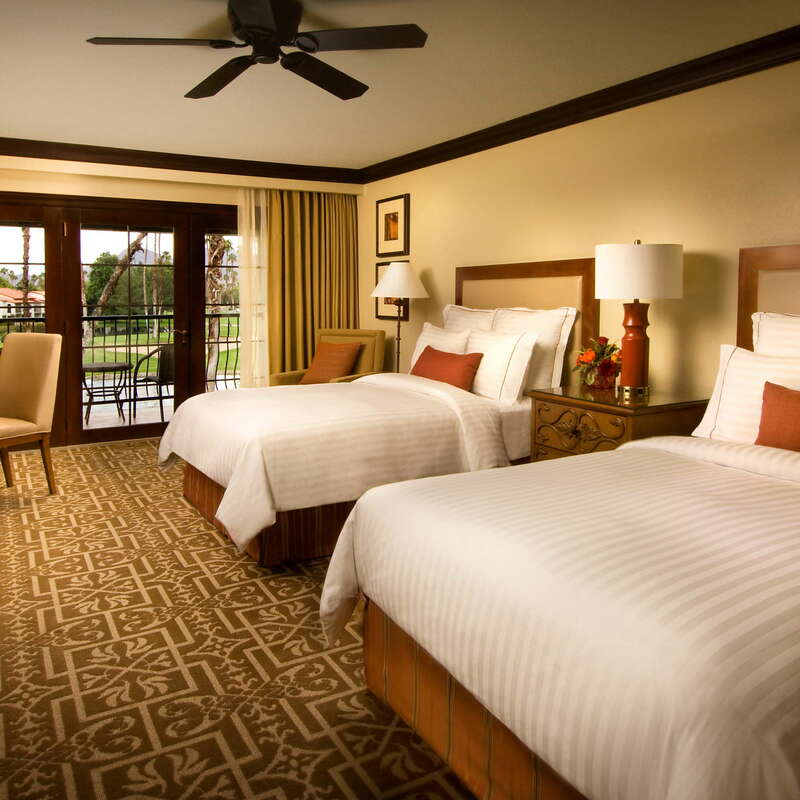 For families, the cozy, welcoming beds and warm, vibrant pops of color feel like a desert escape. Choices abound at the Omni, so guests can select their view (mountain vistas, lake, pool), size (room or suite), and needs (ADA accessible, pet-friendly). Options vary depending on room type, but all bathrooms are well-appointed, comfortably sized, and include spacious vanities. The building looks like a palatial hacienda and the lobby mashes Spanish mission details like exposed beam ceilings and iron light fixtures with modern furniture and accents in bold, bright colors. There’s an interior fireplace and an outdoor plaza. 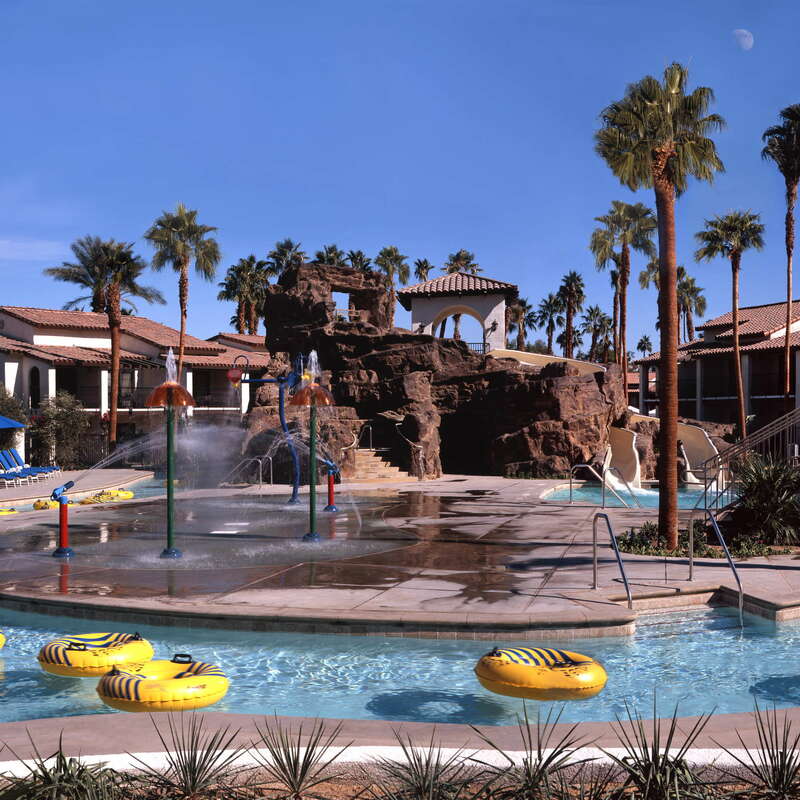 The impressive Splashtopia water park stretches across almost two acres and, with a lazy river and two waterslides, provides outdoor fun geared towards the whole family. The stylish Azure Pool is an adults-only space and there’s also a Spa Pool, open only to spa guests, that plays music underwater. More than 50 spa treatments, ranging from mani/pedis to body wraps to facials to seasonal services and salon packages, are offered. All aromatherapy essential oils are derived from native California plants and extracts. 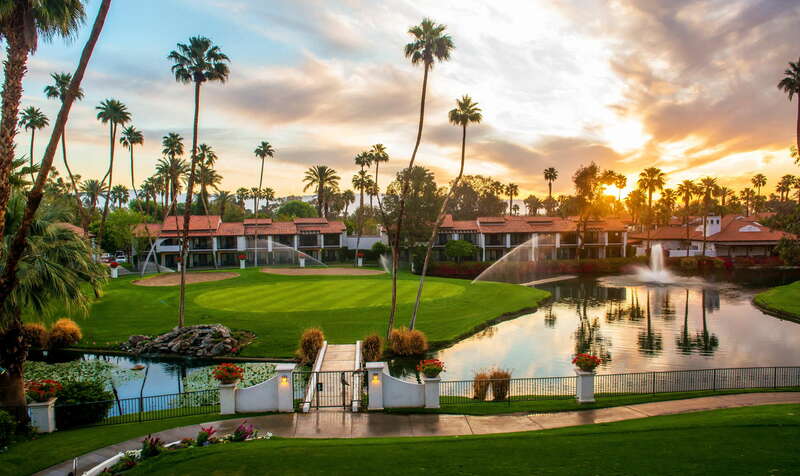 It wouldn’t be Palm Springs without golf and tennis and the Omni hosts a 27-hole golf course and 24 tennis courts. The fitness center is open 24-hours and includes cardio equipment and free weights, as well as specialty Startrac steppers and other Cybex brand equipment. Yoga is offered twice and week and guests can opt to add on a “fitness membership” for unlimited access to spa facilities, pool, the fitness club, and all fitness classes. Several restaurants and cafes are housed within the resort. The Splash Grill provides poolside snacks, kids’ meals, and the kind of drinks you put a tiny umbrella in. The Palms Cafe, also casual, delivers breakfast in addition to sandwiches and brick-oven pizzas. For upscale sit-down and patio dining, Blu Ember is California and New American fare with ambient live entertainment in the evenings. R Bar serves beers, burgers, and cocktails in a masculine, sports bar setting. 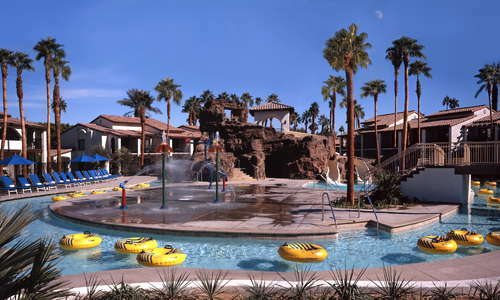 This centrally located resort is easy to access from Palm Springs International Airport (20-minute drive) or from I-10. Situated along the historic Route 111 highway, shopping, dining, and attractions like the Palm Spring Aerial Tramway or Joshua Tree National Park are all easily accessible by car. Valet parking is complimentary, but parking is $10 per day, which is included in the resort service fee. 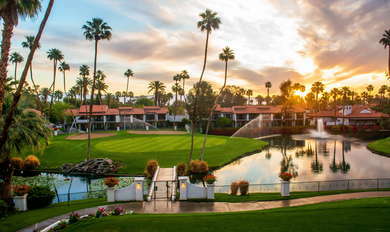 The Omni Rancho Las Palmas is directly across the street from an upscale indoor and outdoor shopping center, The River at Rancho Mirage (3-minute walk; 1-minute drive) which has a multitude of restaurants, including Acqua California Bistro (5-minute walk; 2-minute drive). Slightly farther is Si Bon (5-minute drive) has delicious Belgian waffles for breakfast or mussels and frites for dinner, plus an excellent selection of Belgian beers. In addition to all day happy hour, Dringk Eatery + Bar (6-minute walk; 2-minute drive) has arcade games like Pacman and pinball, foosball and billiards, a shuffleboard table, and a live DJ on Saturday nights. Babe’s Bar-B-Que and Brewhouse (7-minute walk; 3-minute drive) has barbecue, sure, but more importantly they also have award-winning beers brewed on-site. The Splashtopia water park makes it a great bet for families, plus the impressive tennis courts and golf course are fun for (some) adults. It’s a wonderland for the kids, but adults will appreciate all the thoughtful touches, amenities, and the world-class service.